Our number ten spot comes from one of the most well known names in cognac production, Hennessy. Bottled in an updated version of the classic Thomas Bastide crafted Baccarat crystal decanter, which was made popular by another member of the Hennessy family and predecessor to Ellipse, Hennessy Timeless, Ellipse is said to taste of crystallized fruit, wild roses, and earth tones, a whittling down of Hennessy’s trademark taste to its barest, most essential, and most wonderful. Blending the most Spectacular eaux-de-vie Hennessy Ellipse is made by seven generations of blend masters. Bottles of Hennessy Ellipse can range from $12,000 to $13,000 online. That’s just number ten. The prices get astronomical as you go up the list of the 10 Most Expensive Cognac Bottles of All-Time. They say the taste of good cognac is the taste of success. Perhaps that’s why the drink of choice for Hip-Hop moguls to entrepreneurial businessmen and from actors to politicians has remained the same for hundreds of years. Made strictly in the Cognac region of France, this three hundred year-old brandy is legally bound to be distilled in the most acidic, dry, and thin of white wine, which has been classified as ‘undrinkable’ but is perfect for aging and distillation, as well as being aged for at least two years in Limousin oak casks, before receiving the cognac name. While several modern bottles of the drink sell for well over a thousand dollars, some older bottles have sold for a hundreds of thousands or better at private auctions. Below is a short guide to the all time most expensive cognac that money can buy. Coming in ninth is a cognac made by the legendary Madison Hardy, famous for their cognacs since 1863. The Hardy Perfection 140 years cognac is the world’s oldest known unblended cognac. Each of the limited 300 awe inspiring Duam crystal decanters of this fine cognac are numbered and include certificates of authenticity. The origin of the Hardy Perfection can be traced to the 1870’s during the pre-phylloxera period when Madison Hardy founder, Antoine Hardy gathered several different batches of the spectacular eaux-de-vie from which it is made. You can taste hints of coffee, chocolate, and big oak in this cognac’s complex flavor, which retails for upwards of $13,000. The fifth release in cognac maker Camus’ master collection takes the number eight spot, the Camus Cuvee 5.150. 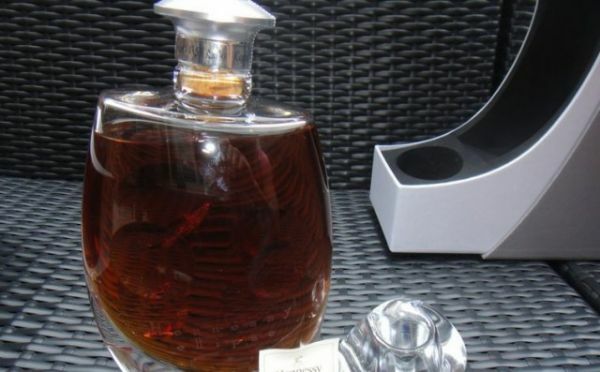 With only 1,492 made this cognac which is bottled in a numbered Baccarat crystal decanter and comes with two tasting glasses. With a blend of five rare, distinct eaux-de-vie from five different cognac growing regions, the taste produced is of a mellow and creamy vanilla, mixed with tropical fruits, and a full, rich accents highlighted by the spicy and woody notes. Released to celebrate Camus’ one hundred and fiftieth anniversary, the Camus Cuvee 5.150 can be yours for a price of $13,500. Number four on the list of all time most expensive cognacs was made using over $1,200 eaux-de-vie ranging between forty and a hundred years old and is named after King Louis XIII, The Remy Martin Black Pearl Louis XIII. With a highly structured taste, The Black Pearl Louis XIII possesses flavors of creamy honey, oak, leather, spice, and chocolate and was, like many cognacs on this list, only released in limited quantities of 775 decanters. Bottled in a Baccarat crystal decanter with thin layers of titanium, carbon, and gold, The Remy Martin Black Pearl Louis XIII has a suggested retail price of $16,000 but can sale for as high as $55,000 in certain markets. The fifth and sixth spots on this list come from the same incendiary makers of cognac, Remy Martin. With a considerable price jump from the suggested $16,000 of our number five spot though, the highest grossing decanter of Remy Martin Louis XIII Grande Champagne Tres Vieille Age Inconnu was purchased at a private sale in Hong Kong in 2013 for a price of $44,630, which was the first of its kind in the country. Using young eaux-de-vie, Remy Martin is said to have set standards of taste with this cognac, though few have tasting notes are available due to the cognacs exclusivity. One of the oldest authenticated vintage cognacs know, a bottle of 1762 Gautier sold for $59,500 to an online bidder this April during New York’s Bonhams auction of Whisky, Cognac, & Rare Spirits. The bottle was circa 1840’s with a wax seal, driven cork, and hand written label ‘coated in cellar grime’. The makers of this rare and expense bottle Gautier have been operational since the early 1700s, receiving a royal warrant from King Louis XV to produce Cognac, and still are in an area nicknamed ‘Little Venice’ in Charente, France. A bottle of 1795 cognac made in Brugerolle that accompanied Napoleon Bonaparte on his conquest to rule the world sold at auction for $149,943 in 2012 taking the number four spot on our list of all time most expensive cognacs. Considered to be the last of its kind in the world, the six liter bottle was said to have been opened by Bonaparte as a celebration drink when victorious in battle. The current Guinness World Record holder for most expensive cognac only breaks number three on our list, the 1858 Croizet Cognac Leonie. Selling at auction in September 2011 for $156,760, this cognac is also a pre-phyllorexa blend and a bottle just like the one sold is said to have been taken out of France during World War II and opened by President Eisenhower while planning the D-day invasions of Normandy. This cognac’s taste is said to be reminiscent of dried poppies and roses, fruity notes, and woody notes such as cedar and sandalwood. Our number two spot comes from the same legendary makers as our number ten spot, Hennessy. The Hennessy Beaute du Siecle, is an exceptional work of cognac craftsmanship and at $194,927 for a decanter designed by French artist Jean-Miche Othoniel, this exquisite cognac makes number two on our list. Made using the rarest eaux-de-vie the Beaute du Siecle has a refined taste echoing Hennessy’s trademark earthy flavors.